Microsoft has partnered with gaming legends Atari to offer up a browser based version of its most famous iconic games, including Pong, Asteroids and Centipede. 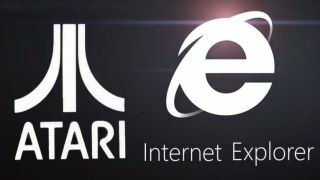 The updated offerings, which coincide with the 40th anniversary of Atari and Pong, will run advert free in IE9 and IE10, but also on other browsers with sponsored messages, and are designed to show off the potential of HTML5. The classic games, available at www.atari.com/arcade have been "reimagined" according to Microsoft's Ian Moulster, who told TechRadar that the games were tailored for touch devices, but also fine to play with mouse and keyboard. "I would say that the fact they are designed specifically for touch, that they have multiplayer and that they tie into people's social networks make this an exciting partnership," said Moulster. The Atari games are familiar beyond their retro cool, with the Atari gaming app currently available for free on iOS devices in iTunes, and older versions available to play on Atari's official website. However, with a cool user interface and some interesting graphical decisions made in the old favourites, Moulster is sure that they will "showcase how cool a web based app can be." "The intention was to show how compelling these games can be on a modern device," he added. "It is relevant in 2012 and uses technologies that were not available when the games were made in 1972."